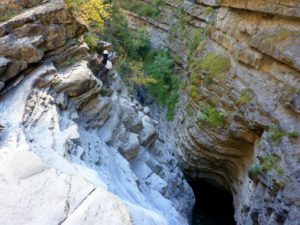 The impressive Mondarruego view point sits alongside the River Ara at the entrance to the Valley of Ordesa with the entrance to the National Park on its west side. The valley enjoys a good range of services: Petrol station, Chemists, Hotels, supermarkets and a health centre. The 16th century chapel of San Blas with its magnificent gothic alter piece of San Salvador, now in the Museum of Zaragoza, is located in the Nuevo Broto neighbourhood. 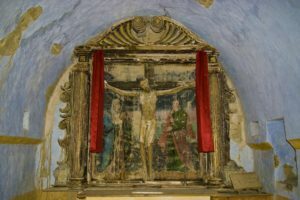 The 16th century chapel of San Clemente is also worth visiting. One of Broto’s most striking buildings is the 16th century tower next to the now derelict bridge. It’s a square based tower with several bay windows, arrow slits and a larger window on the upper floor. 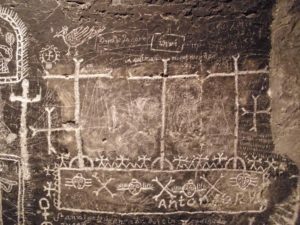 This ancient defence tower was used as a prison for several centuries; you can visit it and examine the curious writing and images the prisoners scratched on the walls. 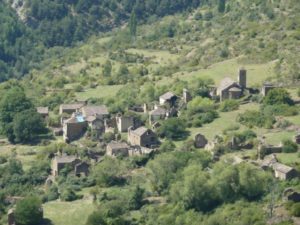 Asín de Broto, Bergua, Buesa, Oto, Sarvisé and Otal (now abandoned) all belong to this municipality. OTO: A pretty village steeped in heritage. Places to visit are: the two military/church towers, the “Don Jorge” house and the church. 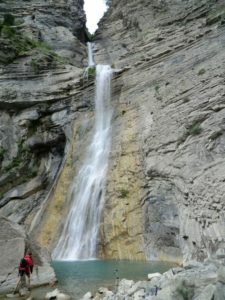 The fantastic Cascada del Sorrosal water fall gives Oto a special charm. 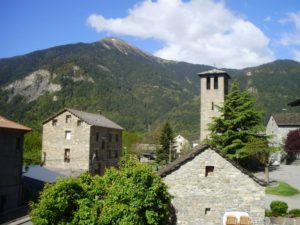 ASIN DE BROTO: The chapel San Mamés sits at the top of this picturesque village; it houses the wooden Christ of Sobrarbe, a Romanesque treasure.